John Beck of Ayrshire Cancer Support is pictured receiving a cheque for £331.60 from the pupils of Straiton Primary School. The children raised the money during December as part of their Christmas activities. Accompanied by staff, parents and friends they toured the village Carol Singing. Their final port of call was The Black Bull Hotel where owners Kenny and Jane had laid on a lovely spread for them. The children also put on a Carol Concert for the senior citizens and a collection was held during the concert, further collections were held at the Infant/Nursery Nativity Play and the Christmas Service at the church. 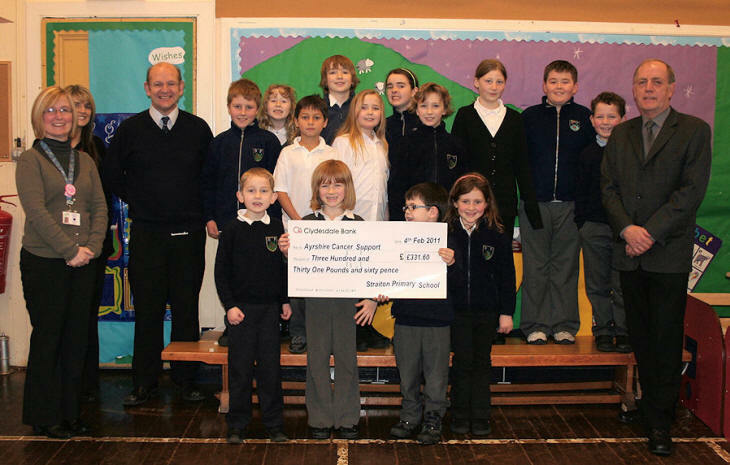 The children and the wider school community were delighted to help Ayrshire Cancer Support who do such great work throughout the district and have been particularly supportive in Straiton recently. John said ‘ We are very grateful to the children and staff of Straiton Primary for their generosity, and also everyone also who helped them. Their generous contribution will be used for the benefit of cancer patients and their families in Ayrshire’.